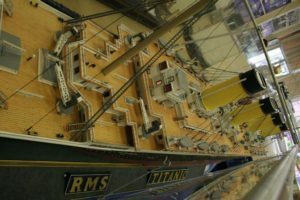 Now you can view in precise detail what the famous ship looked like in our Titanic exhibit. 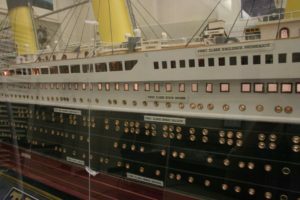 An exact replica of the Titanic is on display at Discovery Station. 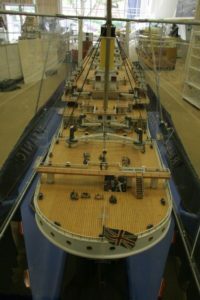 It is one of the largest models of the legendary ship ever constructed and took ten years to build. 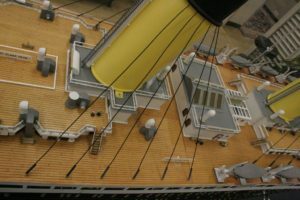 Created by Norman Little from plans and drawings of the original ship, the one-sixtieth scale navigable craft is over fifteen feet in length, weighs 500 pounds, and contains over one thousand portholes. 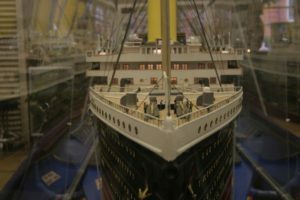 Authentic fittings, stained glass, and passenger replicas add to the realism and historical exactness of the Titanic exhibit. 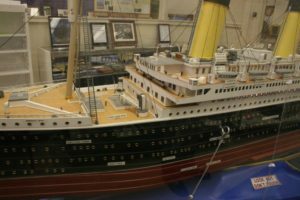 The award-winning Titanic model you will see has been featured on TV, in newspapers and magazines, and on the cover of Model Tech magazine. It is seaworthy and has been sailed by radio control on waterways in Florida, where it was built. On April 10, 1912, the Titanic, the world’s largest and most impressive passenger steamship afloat, left Southampton, England, for New York on its much publicized maiden voyage. Although it was thought to be an unsinkable ship, the Titanic struck an iceberg during the night of April 14 and sank two hours and forty minutes later during the early-morning darkness of April 15. Over 1,500 passengers and crew lost their lives. Responding to a Morse Code distress call from the radiotelegraph room of the Titanic, another ship, the Carpathia, responded and rescued 705 survivors from lifeboats floating on the icy waters of the north Atlantic. Visitors can listen to the distress call on our Morse Code tester. The media frenzy about the Titanic’s famous victims, the legends about the sinking, the resulting investigations and changes in maritime law, and the discovery of the wreck 12,450 feet below the ocean surface in 1985 have contributed to the fame of the Titanic that continues to this day. The Discovery Station Titanic Exhibit includes cutaway views of the Titanic interior and other interesting articles from the Norman Little collection related to the fascinating and tragic story of this legend of the sea. Other interesting objects and articles depicting events of the year 1912 are on display. You can also view a full scale Third Class cabin and a replica of an 1890 steam powered machine shop typical of the machinery used to build the Titanic.